Nathan and Haley have come a very long way on One Tree Hill. Fans just wanna see these two together and happy. This is what it's all about, folks. Brooke and Julian are officially a married couple. We have the maid of honor. We have the groom. We're just waiting on the bride now. Smile, Alex! It's the wedding day of Brooke and Julian. Come on! 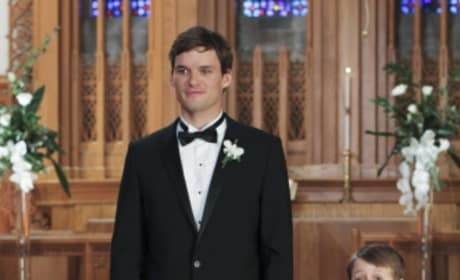 Haley and Nathan survey the wedding scene here. They are a big part of Brooke and Julian's big day. It's a One Tree Hill wedding! We're just so very happy for Brooke and Julian. Here comes the bride, folks! Brooke is making her way down the aisle. Haley has something to say to the bride and groom on their wedding day. She toasts Julian and Brooke here. Julian makes for a handsome groom, doesn't he? In this scene, he's awaiting his bride. Do you take Julian, Brooke? And, Julian, same question for the most part?